Melbourne’s CBD artistic centre of Flinders Lane is slowly being further gentrified. Galleries like Span and Upstairs Flinders Lane have closed, artist’s studios are closing, to make way for more inner city apartments and restaurants. 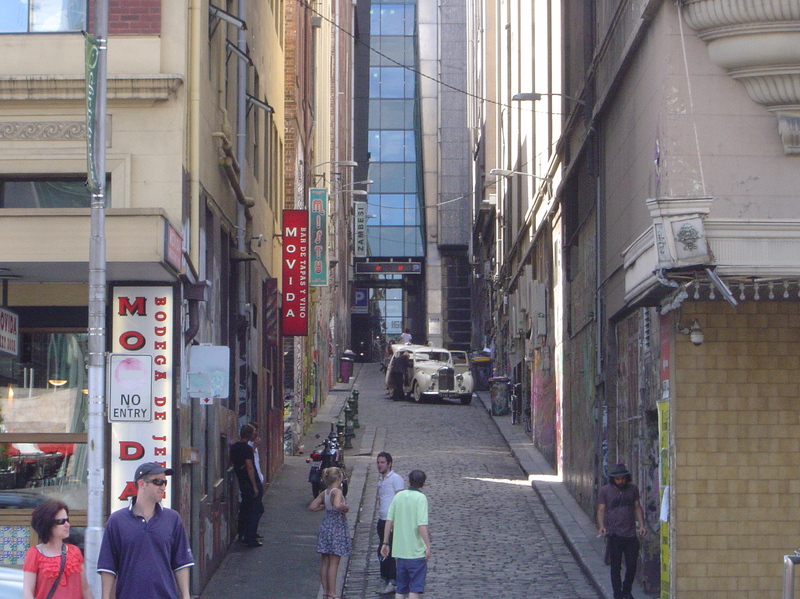 Flinders Lane has been slowly gentrified since its original incarnation as the garment district of Melbourne. Now there are fashion boutiques like Alphaville, designer furniture and jewellery boutiques. And there are plenty of bars and restaurants along Flinders Lane. The charm of Flinders Lane runs out as it crosses Elizabeth St. after that it is the boring business sector of Melbourne’s CBD. The mix of architectural styles along the lane range from the gothic revival of the cathedral, the eclectic style of Australian federation architecture, art noueveau and the international style of glass walled skyscrapers. Look up and see Melbourne’s only glass bottom swimming pool that extends a metre over the lane. There is also AC/DC Lane (formerly Corporation Lane) named after the rock band in 2004 and Melbourne’s only street sign with a lightening bolt through it. Between 1945 and 1956 the fashion photographer Helmut Newton, was working from a small studio on the 5th floor of 353 Flinders Lane, “Pioneer House” which he rented for 5 pounds per month. The proximity to Melbourne’s rag trade was advantageous for Newton’s career. Modern art came to Flinders Lane with Gallery A, established in 1959 by designer Clement Meadmore and furniture manufacture Max Hutchinson. It was a combination of a furniture store and art gallery; and it exhibited contemporary Australian modern artists, including Robert Kippel and John Olsen. Flinders Lane has been the location for many of Melbourne’s established commercial galleries, many specializing in Aboriginal art. There are also rental space and artist-run galleries and spaces in the buildings along Flinders Lane. There is plenty of exhibition space along Flinders Lane. The art at the Melbourne City Library foyer exhibition space has been generally disappointing this year. At the very top of the Flinders Lane there is Craft Victoria with information, a shop and exhibition space with excellent, avant-garde, craft exhibitions. Mailbox 141 must be a difficult space to fill; the fifteen small glass fronted former wooden mailboxes in the small tiled foyer of 141 Flinders Lane do not make it easy for the artist. It might be the smallest art gallery in the world. However, it frequently has surprisingly good exhibitions. Street art is featured just off Flinders Lane, on the famous little Hosier Lane (a street name from the area’s garment district days). With all of the street art Hosier Lane is now a popular location for wedding and advertising photographs, as well as, tourists and school groups who take more photographs. The Nicholas Building on the corner of Swanston Walk and Flinders Lane is still a living cultural centre. 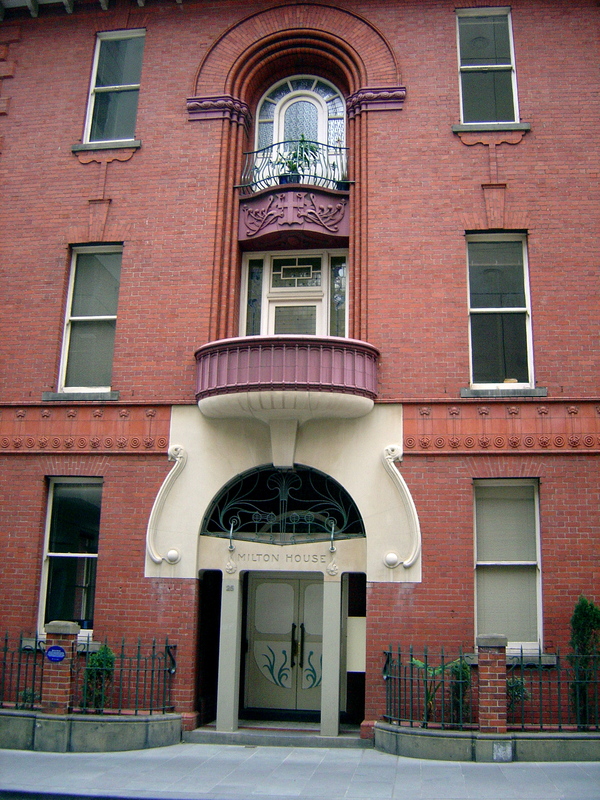 The late, eccentric and artist Vali Meyers once had her studio on the 8th floor of the building. But the antique lifts still work and the upper floors are full of studios, art galleries (Pigment, Blindside and Stephen McLaughlan Gallery), clothes designers, the Victorian Writers Centre and Collected Works Bookshop (the best bookshop for poetry and literature in Melbourne). The high point of Flinders Lane’s part of Melbourne cultural may have passed but there is still a lot of life it. If you are going to visit Flinders Lane I recommend getting off at Parliament Station and walking downhill towards Elizabeth Street, as it will be easier on your legs.